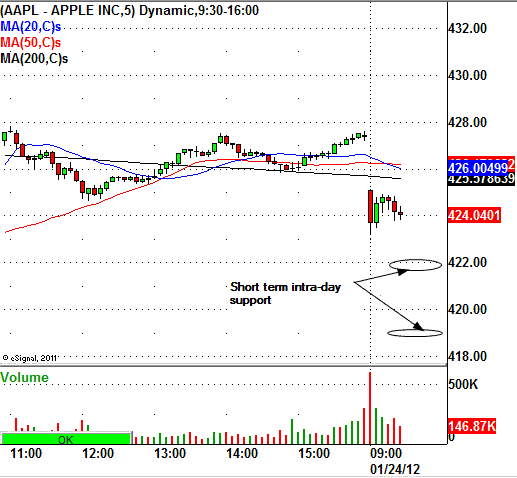 Apple Inc (NASDAQ:AAPL) is declining lower this morning with the major stock indexes. APPL stock is trading lower by $3.70 to $423.70 a share. The popular tech stock will usually hold up well and often rally into earnings. Short term traders can watch for intra-day support around the $422.00, and $419.00 levels should the stock trade down there. As for how the stock will react after the earnings announcement this afternoon is anyone’s guess. Trading a stock into earnings is a very risky gamble as the reaction after the announcement could go either way.